Erected by the Town of Edinburg. Location. 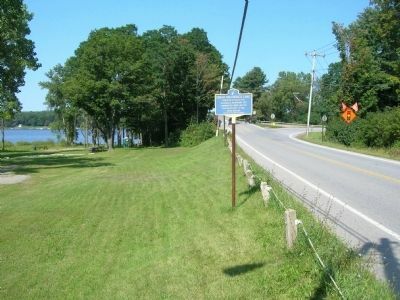 43° 12.548′ N, 74° 4.913′ W. Marker is in Batchellerville, New York, in Saratoga County. 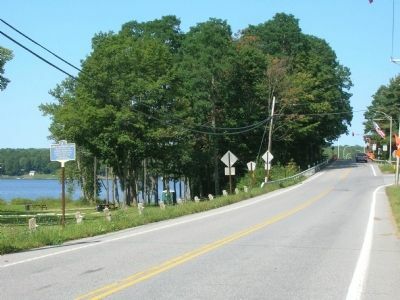 Marker is on South Shore Road (County Route 7), on the right when traveling south. Touch for map. Marker is posted across the street from the Batchellerville Presbyterian Church. 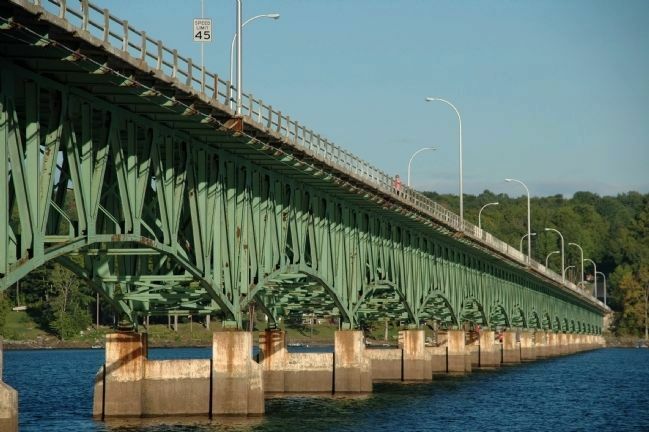 Marker is at or near this postal address: 907 South Shore Road	, Northville NY 12134, United States of America. Touch for directions. (about 500 feet away); Covered Bridge (approx. 1.2 miles away); Carriage Shop (approx. 1.3 miles away); Beecher's Store (approx. 1.4 miles away). 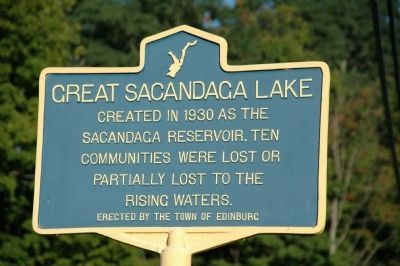 The marker states that ten communities where lost or partially lost to the waters of the Great Sacandaga. They would include: Conklingville, Day Center, a.k.a. 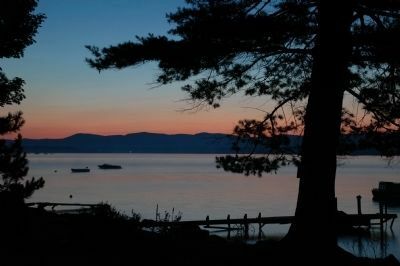 Day Corners, Huntsville, Beecher Hollow, Batchellerville, Fish House, Benedict, Munsonville, Cranberry Creek, Osborne Bridge, Parkville, Sacandaga Park, and the fish and game rich swampy area know as, "The Vly." — Submitted September 25, 2011, by Howard C. Ohlhous of Duanesburg, New York. 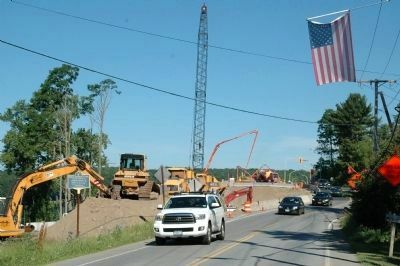 The scene near the marker has changed with the building of the new Batchelorville Bridge. 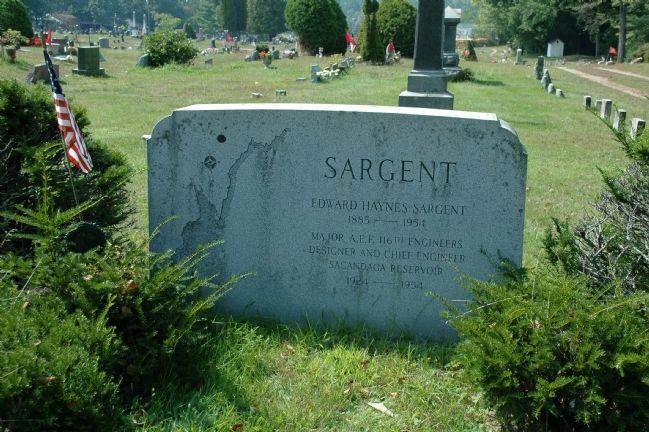 Edward Haynes Sargent was designer and chief engineer of the Sacandaga Reservoir from 1924 until his death in 1954. He had been a major in the American Expeditionary Forces of World War I in the 116th Corps of Engineers. The reservoir today is a living memorial to Mr. Sargent, whose grave lies in the northeast corner of the Edinburg Cemetery. A map of the reservoir is drawn on left side of his gravemarker. More. 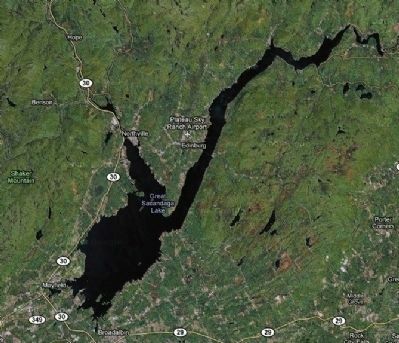 Search the internet for Great Sacandaga Lake. Credits. This page was last revised on March 29, 2019. This page originally submitted on February 8, 2011, by Howard C. Ohlhous of Duanesburg, New York. This page has been viewed 1,606 times since then and 13 times this year. Last updated on March 28, 2019, by Steve Stoessel of Niskayuna, New York. 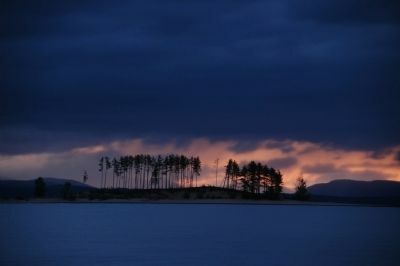 Photos: 1, 2, 3. submitted on February 8, 2011, by Howard C. Ohlhous of Duanesburg, New York. 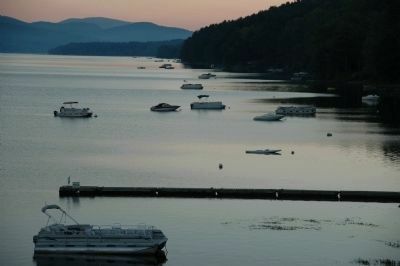 4. submitted on July 9, 2012, by Howard C. Ohlhous of Duanesburg, New York. 5, 6, 7, 8. submitted on February 8, 2011, by Howard C. Ohlhous of Duanesburg, New York. 9, 10. submitted on September 25, 2011, by Howard C. Ohlhous of Duanesburg, New York. • Andrew Ruppenstein was the editor who published this page.